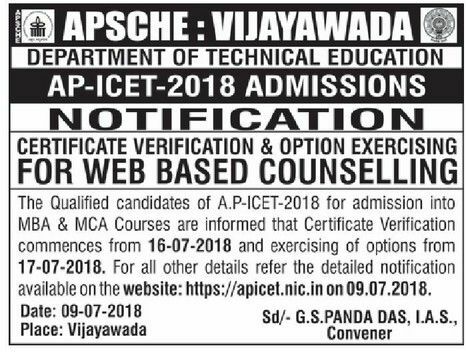 AP ICET Counselling Dates 2018 Rank Wise, Certificate verification, Online Apply Procedure, Colleges web option entry, eligibility, certificates to be produced, fee details, allotment order and all other details refer the detailed notification given below or available on the ap icet 2018 official website https://apicet.nic.in. Candidates can check ap icet 2018 web counselling schedule here. The qualified and eligible candidates of AP-ICET-2018 are informed to attend certificate verification in any one of the Help Line Centers (HLCs) as per the schedule given under. The list of Help Line centres, the distribution of Ranks for each Help Line Centre for Certificate Verification, refer Annexure-I for OC/BC/SC/Minority Category Candidates and Annexure-II for ST Category candidates and all other important information is placed on the Website: https://apicet.nic.in and candidates are informed to visit the website before they go for Certificate Verification. 2. Processing fee can be paid by the candidate using credit card or debit card or through net banking from 15.07.2018. **Candidate shall pay the processing fee through online before they attend for certificate verification at Helpline centres. The processing fee payment procedure is as given under. ONLY AT ANDHRA LOYOLA COLLEGE,NEAR RAMESH HOSPITAL(I T I ROAD), VIJAYAWADA. *PH – (V)-Visually Handicapped, (H)-Hearing impaired (O)-Orthopedically handicapped, NCC- National Cadet Cops; Sports- Sports & Games; CAP- Children of Armed force Personnel. It is informed that other certificates of these candidates will also be verified on the dates mentioned above along with Special Reservation category Certificates. Candidates are instructed to visit the website for rules of admission under CAP/NCC/PH/SPORTS Authority and for priorities. Candidates claiming Special reservation categories SPORTS/NCC/PH/CAP are informed that the decision of SAAP/NCC/PH/CAP Verification authority is final with regard to priorities and genuineness of the certificates produced. Upon allotment, the certificate produced by the candidate is found false/fake the provisional allotment stands cancelled and the candidate is liable for criminal prosecution. Candidates are informed that where there is more than one Help Line Centre in one location, the ranks are distributed Help Line Centre wise and placed on website: https://apicet.nic.in and hence they are informed to attend for certificate verification in the HLC where their ranks are mentioned. (See the Annexure-I for OC/BC/SC/Minority,and Annexure-II for ST category Candidates). All original certificates and two sets of Xerox copies. 7) IX to Degree Study Certificates or Residence Certificate (in case where candidate has no institutionalized education) or Residence certificate of either of the parent in AP for 10 years excluding the period of employment outside Andhra Pradesh from the competent authority in respect of Non-Local Candidates. 10) Aadhar Card (Xerox will also be returned after verification). a) PH – Certificate issued by the District Medical Board. Candidates with 40% and above disability are only eligible. b) CAP – Certificate issued by ZillaSainik Welfare Officer (In case of Ex-Service men) Identity card and Service Discharge book for verification. Candidates whose parents are domicile of Andhra Pradesh are only eligible to be considered under “CAP” Category. c) NCC & Sports – To produce Original Certificates issued by competent authorities. d) Minorities: SSC ‘TC’ containing Minority Status or Certificate from the Head Master. e) Anglo-Indian: A Certificate issued by Competent Authority of their place of Residence. Note: Original Certificates need not be deposited in the college at the time of admission. MCA-Second year direct (Lateral Entry) ALL BCA degree holders and also BSC degree holders with study of Computer Science or Information Technology as one of the subjects. CANDIDATES ARE INSTRUCTED TO CHECK THE ELIGIBILITY GRANTED FOR VARIOUS COURSES (refer receipt of certificates) BEFORE LEAVING HELPLINE CENTER. All ICET-2018 Candidates can exercise their options from any Internet café or Help Line Centre or from their Residence after Certificates Verification on the above mentioned dates. The detailed Procedure of Exercising Options will be placed on the Website:https://apicet.nic.in. All Help line centres will work from 09.00 A.M. to 05.00 P.M on each day. Options will be frozen on 22.07.2018 at 06.00 PM and allotments will be placed in the Website on 24.07.2018 after 6.00 PM. For all other details refer the Website. Convener Office address:CONVENER,APECET-2018 ADMISSIONS, Flat.No:104, ANR towers, Jammichettu Street,Prasadampadu,Vijayawada-521108. Sir pls tel me the second councilling dates. ?????? ap icet 2018 second counsling dates pleace………. Sir… What if any document is pending for verification ? Can i submit it at the time of joining college if i unable to submit with in the counseling days?